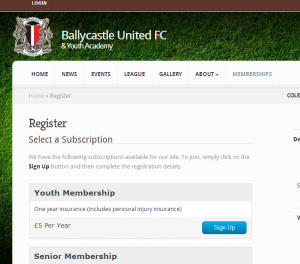 Collect monthly or annual subscriptions via your teamthing.com website. In order to set up your membership you must first describe the levels of subscription that you are offering and also indicate how you will take money e.g.through PayPal. 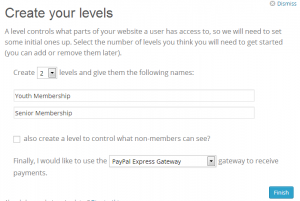 The following steps will show you how to set up your membership so that you can receive payments through PayPal (although other payment options are supported). 1. Make sure the Membership plugin is activated. Go to Dashboard>Plugins and ‘activate’ the membership plugin. 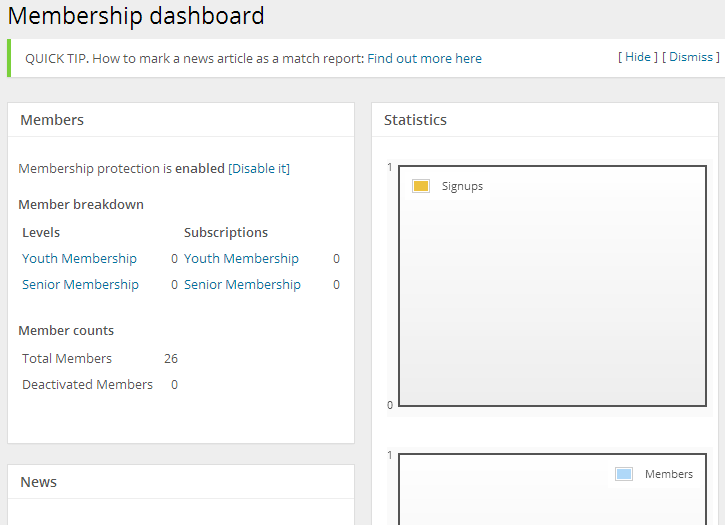 Once successfully activated you will now see the ‘Membership’ menu in your dashboard. 2. Start the membership wizard. 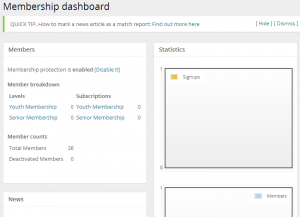 Click the ‘Membership’ menu from your dashboard. Now click the ‘Standard Membership Site’ option and then the ‘Next’ button. 3. Create your membership levels. Add the membership levels by giving the level a name and clicking the ‘Add’ button. For example, some clubs have junior and senior levels of membership and can add both these levels here. 4. Choose Your Payment Gateway. Your payment gateway is the method by which you will receive money from your members. We recommend using PayPal express as it allows your members to pay using their PayPal account or with a credit card. N.B. You need to have a paypal account set up before you start using this gateway. After you have chosen you gateway click ‘Finish. 6. 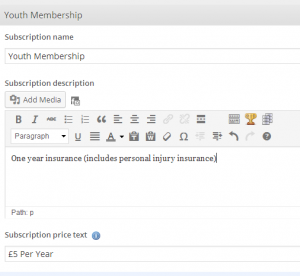 Set membership level costs. 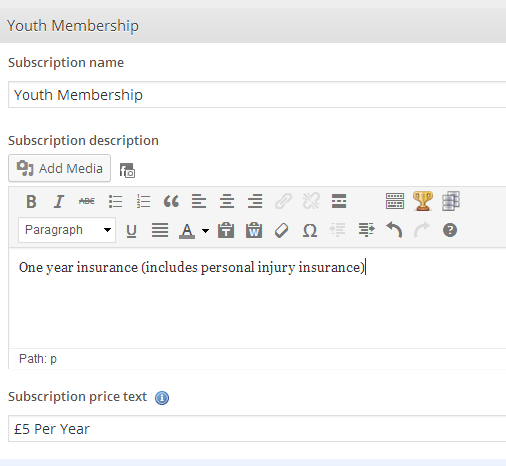 To edit the cost of your membership levels go to Dashboard>Membership>Subscription Plans and click ‘edit’ beside the plan you wish to edit. By default all your website is now protected to users with subscriptions. You MUST now allow ‘strangers’ to access your site by going to Membership>Options>General and changing your ‘Stranger Settings’ to one of your access levels. If your website becomes unavailable at any point i.e. because all content becomes protected from all users then you can always access your dashboard by accessing the wp-admin page e.g. myteam.teamthing.com/wp-admin. Make sure strangers can see your site! 8. View the status of your memberships. Thats all! 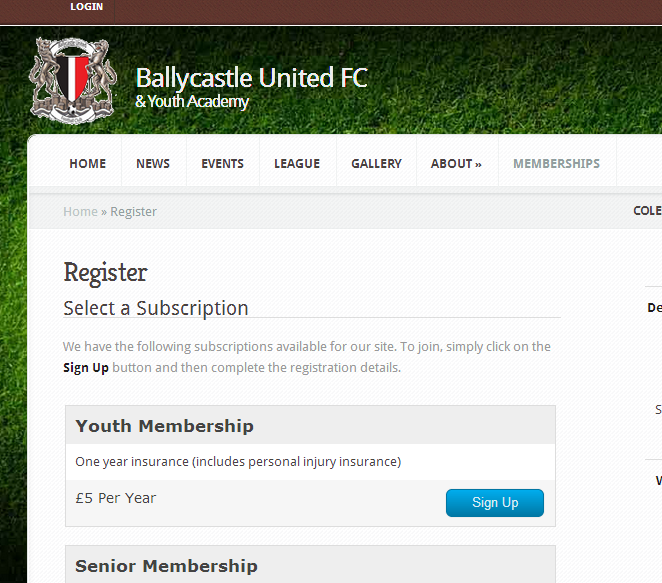 Users can now sign up on your /Register page. Your site should now be ready to take payments from your members. If you need to keep track of all your sign ups you will see some handy graphs in your membership dashboard (Dashboard>Membership). However, we have only scratched the surface in the tutorial of what you can do with our powerful membership tools. Limit content based on subscription level. Allow downloads only for paid members. Create ‘money-off’ coupons to give to new and existing members.